Ginestet & Pouillon 23. Aquatint printed in colors on laid paper, watermarked Arches, full margins. Edition of 25. Very rare. Signed and numbered 13/25 in pencil. 19 13/16 x 14in. ;50.3 x35.6cm. Danseuse Espagnole is Villon’s masterpiece of the Belle Epoque period, when he created more than 100 color prints between 1899 and 1910. 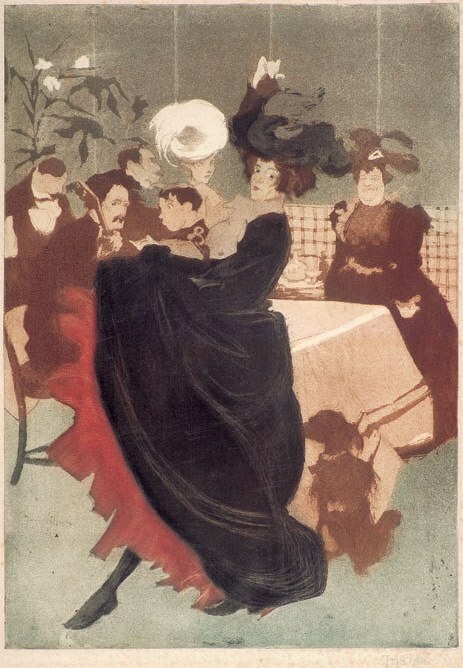 Like Toulouse-Lautrec, Villon vividly portrayed the dance halls and cafes of Paris, and Spanish dancers were popular entertainment during these years. Villon’s color aquatints are unusual for his use of almost pure aquatint with a loose, experimental application of acid to the plate. This very rare impression, one of only 25 proofs, is in fine condition and each proof is slightly different in the inking and color choice.